Cam Lingle batted 2-for-3 and hit a 2-run homer to lead the Leopards in their 5-1 victory over the visiting Orangeman. Jordan Shearer pitched 6 shutout innings and struck out 8 to earn the victory for 10-3 Louisville. Dillon Rebuck batted 3-for-5 with 3 RBIs including a walk-off single as he Leopards run-ruled the Cardinals 16-6. Cam King also drove in 5 runs and both Davis Burick & Cam Lingle had multi-hit games for Louisville. Tyler Jackson, Austin Pugh, and Logan Vanicek all recorded 2 hits each and combined for 5 RBIs as Louisville Varsity Blue run-ruled the Garfield G-Men 11-1 in 5 innings for their first victory. Jake Bevere earned the win on the mound. Davis Burick drove in a pair of runs including the first in the Leopards 2-run seventh inning rally to tie the scrimmage at 6-6 against the host Aviators. Austin Cummings and Caleb Prasco also drove in runs during an earlier Louisville rallying. These are highlight videos for Leopards Wide Receiver, Quarterback, and Defensive Back Carter Rode for the 2016, 2017, and 2018 Football Seasons. Davis Burick finished with 5 catches for 106 yards but the Leopards fell to the Tigers 41-0. Jared Mathie also recovered a fumble and Carter Rode recorded an interception for 5-4 Louisville. Jared Mathie made 8 catches for 123 yards and caught 2 touchdowns to lead the Louisville offense in a 27-6 victory over visiting South Range. Colton Jones also threw for 257 yards and 3 touchdowns and Max Hartline & Bryce Zuppe also found the endzone for the 5-3 Leopards. Grayson Beamer and Bryce Zuppe each had pick sixes to clinch Louisville’s 45-20 victory over Youngstown Ursuline. Colton Jones threw for 253 yards and 3 touchdown passes and Max Hartline ran for 109 yards and a touchdown. 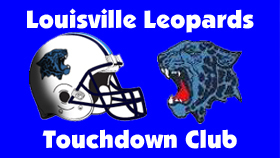 Max Hartline rushed for 161 yards and 2 touchdowns to lead the Leopards in a 31-20 victory over the visiting Bulldogs. Colton Jones also hooked up with Davis Burick for two scores and the Louisville defense recorded 3 takeaways. The Leopards fell to the 3-time defending state champion Knights 21-10 in a one half scrimmage. Colton Jones connected with Hunter Selander for a 7 yard touchdown pass with 9 seconds left for Louisville’s only score. Watch Video Highlights.